2016 is almost over! Believe it! All this will soon be behind us. And what better way to celebrate the new year than with a poetry marathon? 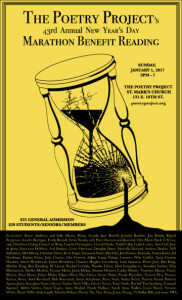 I have the great honor of reading this year at the Poetry Project’s 43rd Annual New Year’s Day Marathon. 131 E. 10th St. NYC from 3pm January 1st until. $25 general admission, $20 students/seniors/members. Come through. I’ll be there some time along with lots of other wonderful poets & musicians. Let’s get 2017 started right. If you’re interested in getting involved behind the scenes and getting into the Marathon for FREE, consider volunteering two hours of your time to help to make the event happen. Email lh@poetryproject.org for more information or to sign-up.